Bits and Pieces...: So. Tired. What a week it's been. I'm beat! I drove 3 1/2 hours to Long Island for a funeral on Tuesday and turned around and drove back today. It was wonderful spending time with one of my best friends in the world, but it was also so draining and sad. I went straight to work today and have to drive to the other end of the state tomorrow. Then, there's baseball all day Saturday and a scouting event on Sunday. I really just want to crawl into my scraproom and create, but I can't! Soon, I hope. Especially since I've got a big deadline coming up. Anyway, I just wanted to share a couple of things. This first card uses Webster's Country Estate papers. Love them. 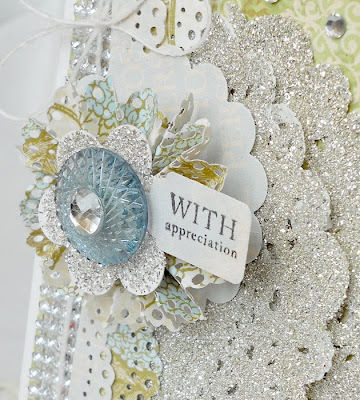 I glittered a doily and added a sparkler and some of the funky Hollywood Vogue silver trim. 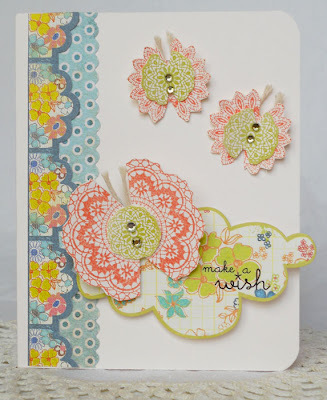 This next one is a fun card I made using some My Mind's Eye Stella and Rose doily stamps. I stamped them, cut them out, cut notches into the tops and turned them into butterflies. The paper is Sassafrass, as are the stickers. Go to bed! ;o) ....... your cards are beautiful! I love the glittery look on that first one. thank you so much for sharing! So sorry for all this. Hope you get some rest to enjoy this weekend. Wow these are gorgeous! Is that German glass glitter on the doilies? I hope you'll get some rest and enjoy the weekend! rest and refresh, dear girl! Thanks for sharing your fab creations! Oh gosh, poor you...it sounds like you've had a super busy week indeed. Hope you can get some rest this weekend. Your cards are both utterly gorgeous. I especially love the glitter doilies on the first one. Big Hugs!! Hope you get some relaxation time soon! Your work is MAGNIFICENT as always! It is truly breathtaking! beautiful, I hope you get some good rest. :)Enjoy the weekend! Oh, how gorgeous, Anabelle! That glittered doily is AMAZING! look at the beautiful first card. oh i love it so much. really great job!!! Sorry about your crazy week, Anabelle! Hope things slow down for you soon. :) Love your cards. You sure know how to rock the Webster's. 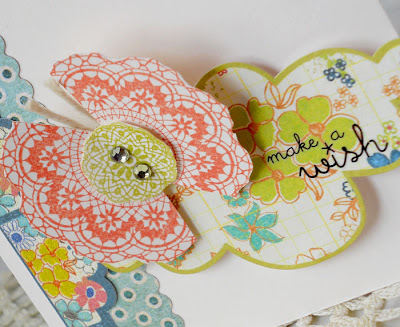 Love the glittered doily and the beautiful flower you made. Awesome butterflies, too. That is such a clever use for those stamps. So sorry for your loss sweet friend. Both of these cards are just stunning. Love that glitter. Happy Birthday, Shabby Tea Room!